Given that an astronaut's space walk appeared to draw some curious onlookers, it's not surprising that a cargo spacecraft's departure from the International Space Station may have done the same. 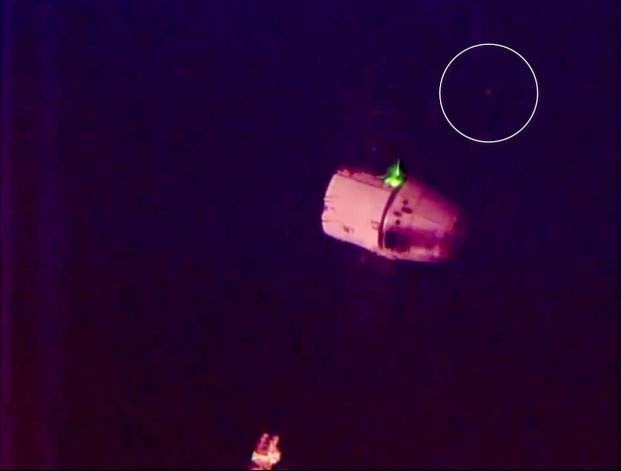 On Oct. 25, the cargo spacecraft Dragon owned by Space X shoved off from the space station after a month's visit and splashed down in the Pacific Ocean, about 300 miles west of Baja California. It was carrying nearly 3,300 pounds of NASA cargo and science samples from the space station. Just as it was shoving off from the ISS, a video made by a NASA camera on board the space station captured what appears to be some sort of unidentified craft, in short a UFO. The small, relatively faint circle of light can be seen for a few seconds before fading from view. The Internet has been humming with talk about the unexplained presence, but NASA has not made an official comment. This was the Dragon's fourth resupply mission to the space station, with eight more scheduled through 2016, according to a NASA statement.